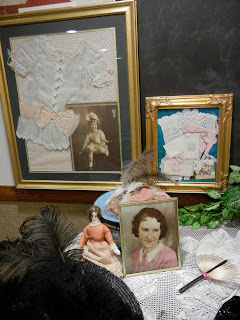 A women's organization where I serve as a co-chair on the activity planning committee recently hosted a presentation titled "Grandma's Suitcase". It was on the of history women's clothing for the last 150 years. It was a very interesting and entertaining evening. The presenter, has a gold mind of vintage and antique clothing and knowledge. Many of her pieces were made and worn by those on her very own family tree. and shared the history of it. So many beautiful things! She has been doing this "volunteer" presentation for several years. Vintage babies in vintage clothing. Actual photo of a loved one wearing this piece. It was amazing to see the hand sewing of over a century and a half ago. The first bras, garter belts, and corsets were very primitive by today's standards. The handmade eyelet fabrics and the hand embroidery work on the clothing was beautiful. And, to think they probably did it by candlelight! I was in absolute awe in all that the presenter knew about her family that lived generations before her and in her knowledge of vintage and antique clothing. Over the years she has taken her volunteer presentation to many senior homes and centers. 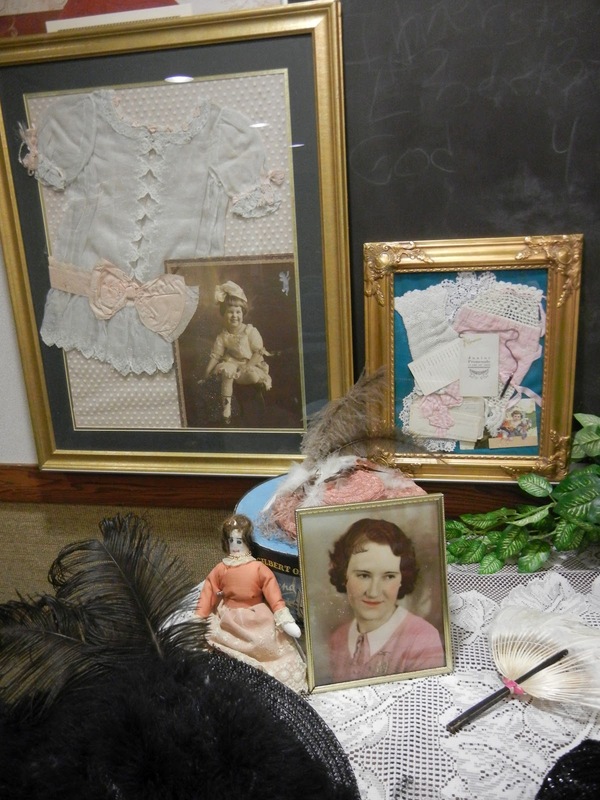 Many who have enjoyed her presentation have added to her stories and have given her special items that they have kept over the decades to add to her collection. We put together a Vintage Dessert Social to follow the presentation. As the women entered the social there was old time music playing and a vintage style serving table to add to the feeling of the evening. asked me to have lunch with her one day. I too have a collection of things that are very special to me. by my own mother and grandmothers adorned the table. In fact, the little iron you see above. She has one just like it! The desserts were bite size in mini cupcake wrappers. for donation to a local women's shelter. socializing and old fashioned sisterhood! What an amazing event! I would have loved to have been there. And you certainly got in the spirit with your decorations. Beautiful, as always.